I’ve been getting a lot of requests lately for recipes that feature (and use up!) zucchini and the more the better! Seems that the short season this veggie appears leaves a lot of people wondering what to do with all these glorious ‘green wonders’. Can you tell that I am a true zucchini fan? Today I’m sharing a VERY ‘speedy’ main dish recipe, Quick and Easy Zucchini Stir-Fry. If you have 30 minutes to get supper on the table but still want something satisfying, fresh and delicious, give this one a try. 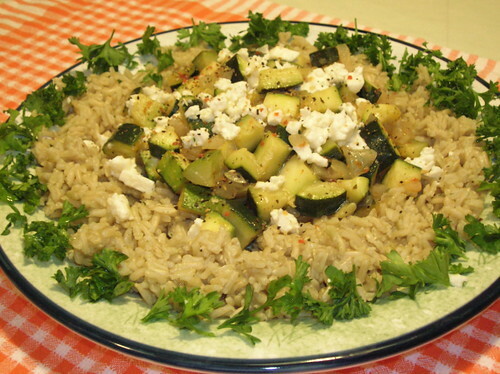 Yummy with a sprinkle of feta cheese on top (as in photo) for a nice flavor contrast. Also try: Zucchini and Cheddar Fettuccini, a yummy, rich and delicious main dish. If the garden harvest has you drowning in these glorious ‘green wonders’ prepare to enjoy this tasty dish, again and again. Quick, filling and delicious. Try it served over any type of pasta, rice, quinoa or equally good on it’s own. Garnish: Chopped fresh parsley, feta cheese or light sour cream. In a large skillet or wok, heat Italian dressing over medium heat. Add onions and sauté for 1 minute. Stir in zucchini cubes and continue to sauté for 5 more minutes. Add seasoning and stir to thoroughly combine. Continue to cook for 1 more minute or until zucchini cubes are cooked through but still crunchy. Serve immediately topped with chopped parsley, feta cheese or a drizzle of sour cream if desired. Reprinted from: Not Just for Vegetarians, Delicious Homestyle Cooking, the Meatless Way by Geraldine Hartman.All Rights Reserved. Last night my husband asked why I had purchased buttermilk. I told him “I’m going to make a chocolate cake recipe that takes buttermilk.” I just didn’t mention the “secret ingredient.” 🙂 My zucchini is coming on strong right now and I’ve already started giving it away! This stir fry looks tempting as well! Geraldine you have so much energy and it just shines through. I WANT THE FOOD IN THIS PICTURE!!! I have your book as you know and will be reviewing the hell out of it this week PLUS I look forward to doing more with you over the coming weeks with the newsletter. I just bought a GIGANTIC zucchini!! This looks delicious!! I think I may make some zucchini muffins/bread as well!! Dear Opal, I love zucchini too….great time of year for it. Dear Mandy, Let me know how the recipe turns out and if it was a hit! Dear Beth, Tell hubby to leave the cooking to YOU, Im sure you do a great job!Glad you are enjoying my cookbook. Dear Al, Thanks for your kind words and compliments. A big hug to you for your supportive email too, meant a lot. Yes, bring on those recipes and review, Veggie…readers, stay tuned! Dear Tasha, Look forward to hearing about your Z-results. Hi RaeDi, Is sooo good, very easy and quick too. I like this one on the hot “too hot to cook” nights! thanks for your very kind words too. I hope you’ll stop in again soon. I love your blog btw. Hi Ms. Pie, Message received and names put together in the right order LOL, I didn’t want to mix up prizes and all. Hope you give this recipe a try soon.